Question: How did the Arlington real estate market do in 2017? Answer: In July I wrote that the Arlington market was picking up momentum and after two years of light growth in Arlington, we saw our first year of growth over 2% since 2014 (3.1%). Over 3,100 homes were sold in 2017 compared to approximately 2,900 in 2016 and total sales volume was nearly $2.1B compared to last year’s total of just under $1.9B. In addition to solid price growth, other momentum indicators improved (if you’re a homeowner/seller) with homes selling nearly one week faster and for ½ percent closer to the original asking price than last year. Price growth and demand were driven almost entirely by South Arlington with 22202, 22204 and 22206 seeing some of the greatest improvement. Once again, the most expensive sale in Arlington was a Rosslyn condo at Waterview with 3,800+ sq. ft. and unobstructed views of the Potomac. It sold for $3,258,000 and took just over a year to sell. Price Growth: The average price of homes in Arlington has increased every year since 2010, but was slow the last two years. The 22201 and 22203 zip codes continued a steady decline, while 22205 surged forward with an incredible 6.9% YoY increase. Overall, Arlington continues to deliver as promised to most homeowners and investors… steady and stable growth. Demand Growth: Outside of price growth, my two favorite indicators of demand are days on market (time from listing to ratified contract) and the ratio of sold price to original asking price (100% = buyer paid full ask). Both indicators saw their biggest improvement since 2013 with homes selling faster and for closer to their asking price in seven of nine zip codes. While changes weren’t extreme, they’re enough to say the Arlington market has officially picked up steam heading into 2018. New Construction: 2017 was big year for new construction. We saw the release of two large condo projects – Trafalgar Flats and Key & Nash – as well as strong sales for the final phase of the luxury condos at Gaslight Square in Rosslyn. 2017 also brought the start and close-out of the highly successful Carver Place townhouse project off Columbia Pike by Craftmark, as well as the introduction of a luxury townhouse project, 1100 Block, a few blocks north of the Ballston metro. Single family new home construction continues to impress with 130 new homes sold in 2017 for an average sale price of a whopping $1,540,000. 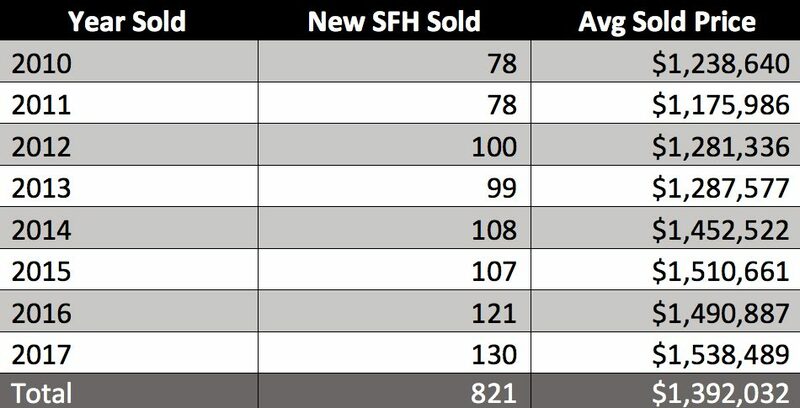 Note that the below statistics do not include all sales of new homes, just those entered into MRIS (system of record), which is likely about 80% of total new single-family home sales. Looking Ahead To 2018+: Arlington residential real estate growth will continue to hinge on our office vacancy rates. With Nestle committing to Rosslyn in 2017 and arriving in 2018, the door is open to attracting big business not directly associated with the Federal Government. There’s no doubt that their decision will generate interest from other companies who otherwise would not have considered Arlington. If we make it to the second round of Amazon’s HQ2, we should have an exciting decade ahead. Beyond vacancy rates, growth will depend on addressing crowded schools, balancing infrastructure investment across the entire county, business improvement along Columbia Pike and Lee Highway and ensuring that the natural beauty of our neighborhoods (trees and green space) isn’t destroyed by irresponsible development. With regard to the impact the new tax plan will have, expect a full column on this in the coming weeks. I’ll close with a recent quote by Paul T. McDermott, President and CEO of Washington REIT, who recently sold their position in a major DC building to move assets into Arlington. If you’re considering buying, selling, or investing within the Arlington market in 2018, I’d be happy to schedule some time to meet. You can reach me any time by email at Eli@EliResidential.com or phone at (703) 539-2529.